Do you know of any easier way than to press a button to let your friends in? That's exactly what the Intercom System does. In fact, that's a fraction of what gate intercom systems can offer since they also offer you the chance to have visual contact and two ways voice communication with visitors. They can be connected to your gate opener keypad and home phone and they can be of great convenience to those living in big apartment buildings but also for the people working at grand facilities and huge commercial establishments. “Gate Repair Studio City” is an expert and well-equipped contractor and can provide excellent consultation, products and services. 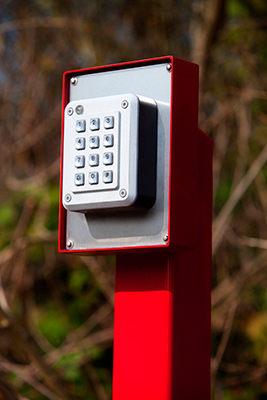 Our technicians have the knowledge to keep you updated with the recent developments of gate phone enter systems, explain their usage and importance. We get updated with innovations ourselves and we train in accordance to the characteristics of different models. We are prepared to provide our expert intercom repair services and advise you according to what you are searching for. Our company has the pleasure to work with the most well-known manufacturers and our gate repair experts are aware of all brands, the latest systems and what services are needed. We are trained to install all types of intercom systems but first we make sure they are perfect for your own gate and needs. Whether you select Linear phone entry systems, products made by Aiphone or Doorking intercom, you can be sure that our technicians have the expertise to program and install them. We are accurate, exceptional and consistent professionals, and have great knowledge of all intercom gate systems. You can have faith in our expertise and professionalism to assist you when you are in need of such systems or for services. We promise outstanding intercom installation and rest assured that we don't only have the knowhow but also the right equipment to support our work. You can expect great services by Gate Repair Studio City since we are experienced and well-organized contractors. Call us for same day intercom service!